Writing Creatively: Study and Learn! As my income performs like a magician in a vanishing act, I find myself grasping at anything and everything I can find that might improve my financial standing in the Universe. From trying to teach myself html (I haven't looked at the book since before my family came to visit and they're already gone), to trying to understand the concept of blog promotion, I have been spending every available minute focused on writing and blogging – well, when I'm not providing daycare. In my spare time, I stand on a corner in cyberspace announcing my presence to the cosmos, and so far – with this blog anyway – only 6 people have heard my whine for recognition. So I thought, hmm, maybe I'm not the only blogger who isn't getting noticed. Why not offer a blog that allows other bloggers to get recognition? 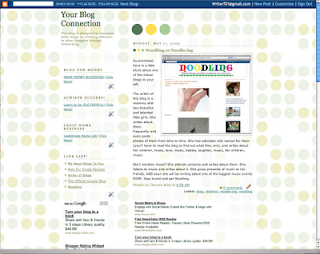 I would link that blog to their blog, and I would showcase their blog with a blog about their blog. Is it possible to say the word "blog" too many times in a sentence? Not one to allow a good idea to whither away, I came up with Your Blog Connection. And I'm ready to go to work. So if you know of anybody who would like to see their blog showcased, let me know. You might even want to choose your own. Hey I think that's a pretty good idea, maybe even have categories...anyway Good Thinking! only 6 people have heard my whine for recognition.Now we are 7 (okay, so I just finished watching a certain Yul Brynner, Steve McQueen western).